This waterfall, very near the cozy town of Stowe, Vermont, is a multi-faceted wonder. The most unique aspect of Moss Glen lies in its varying waterfall types. Starting as a plunge waterfall (top of picture), the waterfall then proceeds down as a slide before finally reaching the base as a segmented fan. The hike is short and well worth the effort. 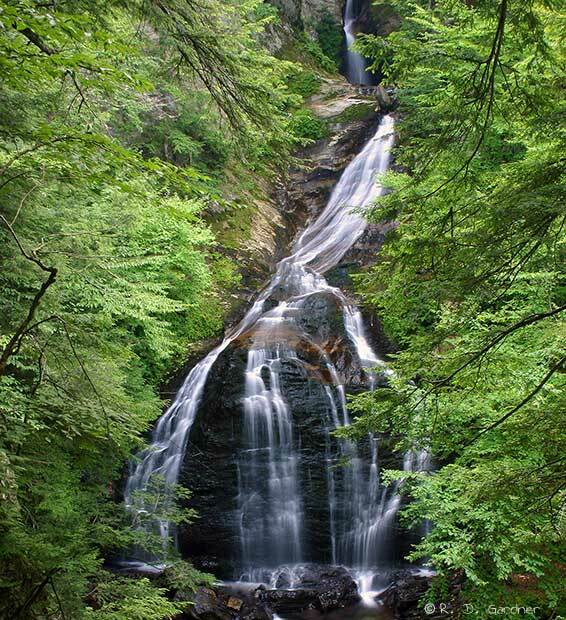 If you want to linger at the waterfall, there is limited seating for a snack or lunch under the large hemlock trees that dominate the area. Moss Glen Falls is located just north of Stowe, VT. Follow Highway 100 North out of town. After about 3 miles the highway veers left - continue straight on Randolph Rd. Next, in about 1/4 mile take a right onto Moss Glen Falls Rd. The parking area is well pretty well marked about 1/2 mile down the road on the left. It is public land and my recollection is that there was a small sign with day use rules. The hike is flat until you reach the base of the falls. Note that the field you cross is a bit marshy and wet. Boards were down on the path to help but you still may end up with wet, muddy feet. When the trail nears the waterfall, you can either proceed through the stream (some wading) to the base of the falls or climb the hill for a very nice overlook of the waterfall. My pictures were all taken from the overlook area as I wasn't prepared for wading. I arrived at Moss Glen Falls in the morning. Lighting conditions were good with a slight overcast. The main picture above had a 5 second exposure which was about perfect for this size and type of waterfall. Obviously you will need a good tripod to get an exposure of that length. Focal length - I would recommend both a wide angle and telephoto lens. You will want the wide angle to get the whole waterfall but will need a 200-300 mm lens to isolation the top of the waterfall. I would also recommend the use of a polarizer to cut down on reflections off of the granite. You will need to correct the color cast of the polarizer either with a warming filter or with post processing with a program like Photoshop. There are many choices of composition, fewer if you don't want to wade to the bottom. Try some isolated shots of the top and bottom of the falls. Also you might want to zoom all the way out and take more of a landscape shot. The trees here are beautiful and you can always crop to your heart's desire on the computer.